Car Trunk Organizer Collapsible Grocery Cargo Storage 50% OFF with Code! 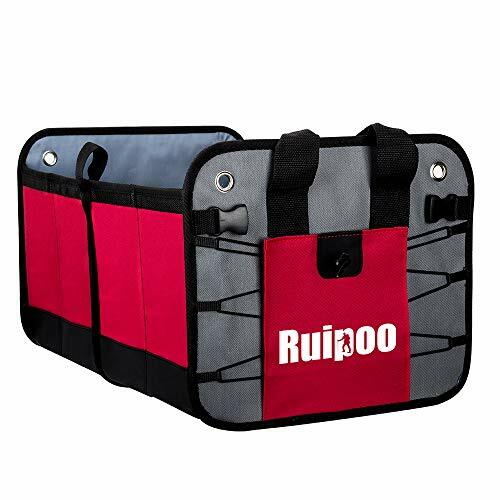 ✔Collapsible and sturdy: the car organizer can fold down flat, simply fold it up and store it away in the trunk or drawer when not use, saving your space. easy to carry, strong and heavy duty strap handles allow for carry and transport even fully-loaded with ease(allow up to 100Ibs in weight ). the strong stitching let you no worry about the trunk will ripped away along the stitched seam on the side. ✔Large capacity: the trunk organizer has multiple pockets to fully meet your daily need, 2 roomy compartments for you to organize important emergency equipment, 2 side pockets on both ends gives you extra storage space to help you super-organized, keep car looks tidy and neat, free your trunk floor and you can also access the item easier and faster. ✔Multifunctional: the car trunk storage fits great with all vehicles(truck, SUV, van, jeep, car), carrying and organizing groceries, as well as a good storage basket for household items, such as cell phones, pill boxes, keys, books, tablets, maps, magazines, equipment tools, sporting goods, cleaning supplies, pets and kid toys, snacks, electronic accessories. this is a very useful daily item in your life. ✔Special design: the car trunk storage with 3-layer waterproof leather bottom board, reinforced base plates, strong and sturdy side walls, 2 strong and unbreakable buckle, the car trunk organizer also with non slipping blocks and two small handles on the top of the trunk to allowed you to fix the trunk with strap while on the go , no more sliding bothering you! ✔Easy to clean: the car storage is use anti-scratch and anti-dirty thick fabric , very easy to clean the particular material inside, spot clean organizers using water and a towel. the trunk organizer also will last through years of use.